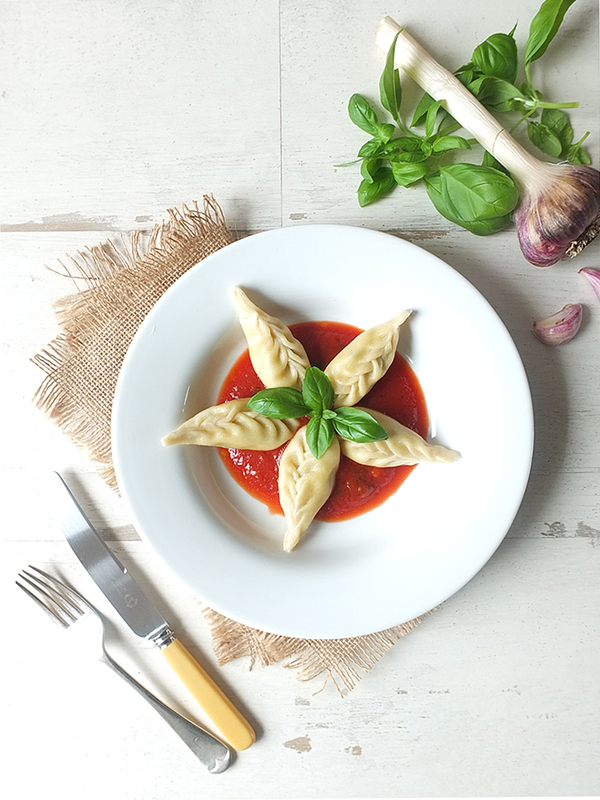 Culurgiones are traditional Sardinian dough pockets stuffed with potato and mint served with a simple tomato sauce. The trick to making them is in the stitching! In collaboration with James Villas Holidays. 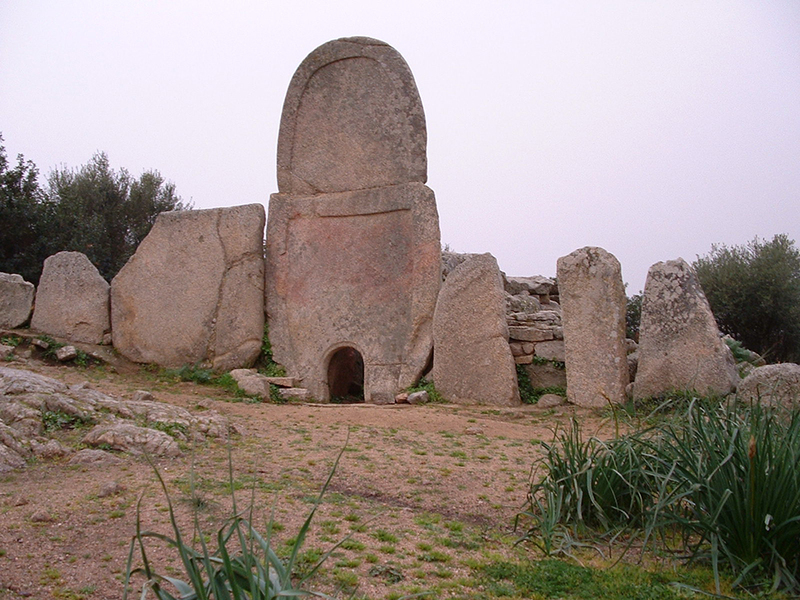 Many, many years ago I had the privilege of visiting the island of Sardinia on an all expenses paid whirlwind weekend trip. It was the car launch for the Fiat Idea and I was a plus one, and let me tell you, I have never been so wined and dined in my life! 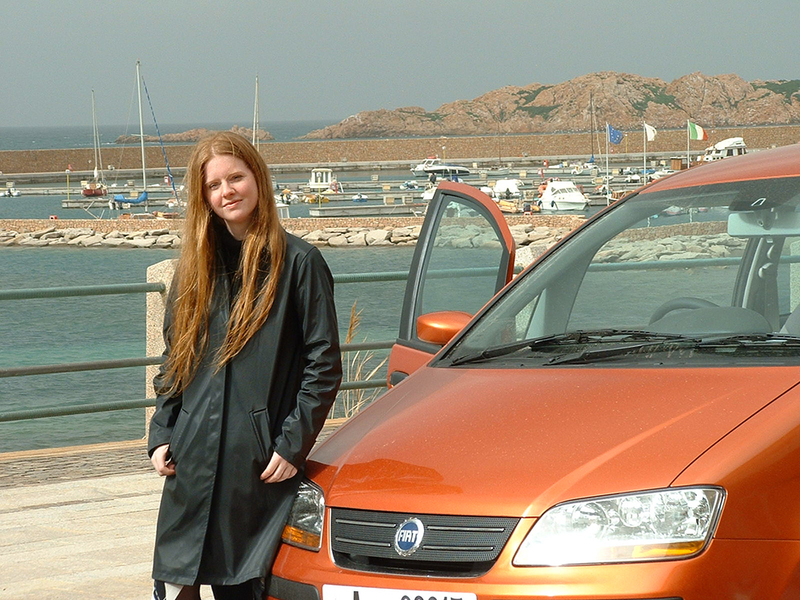 The irony was, at the time, I didn’t even have a driving license, and here I was on one of Italy’s most stunning islands, being driven about in a recently launched Italian car. I do believe this trip was where I officially fell in love with food and learned to embrace and savor new tastes and textures. Up until this point I disliked olives, intensely. 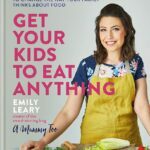 I would pick them out of whatever food I was eating and stubbornly refuse to entertain the notion of eating them (quite like how my children often behave when introduced to a new food!). However, during this trip I was introduced to so many new dishes I couldn’t help but get swept up in the atmosphere and immerse myself completely, well, almost. 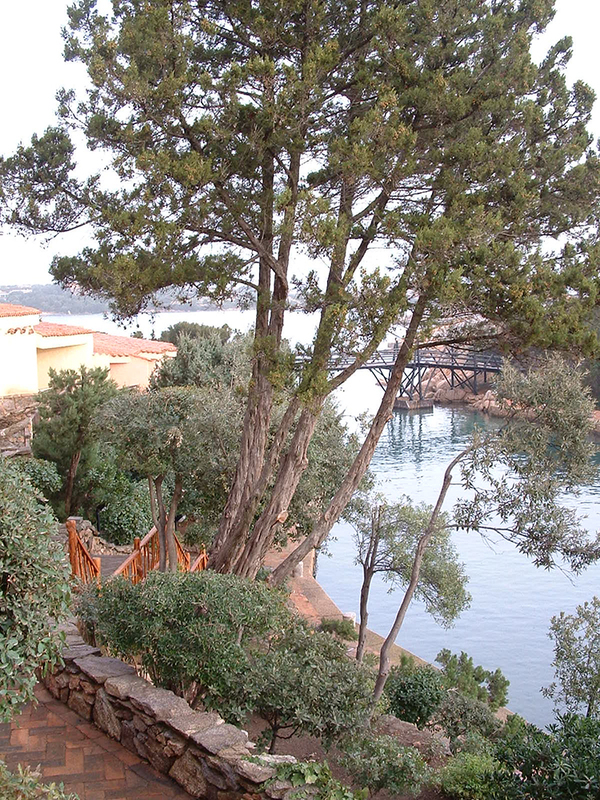 We were staying in a hotel in Porto Cervo, right on the shores of the Mediterranean. 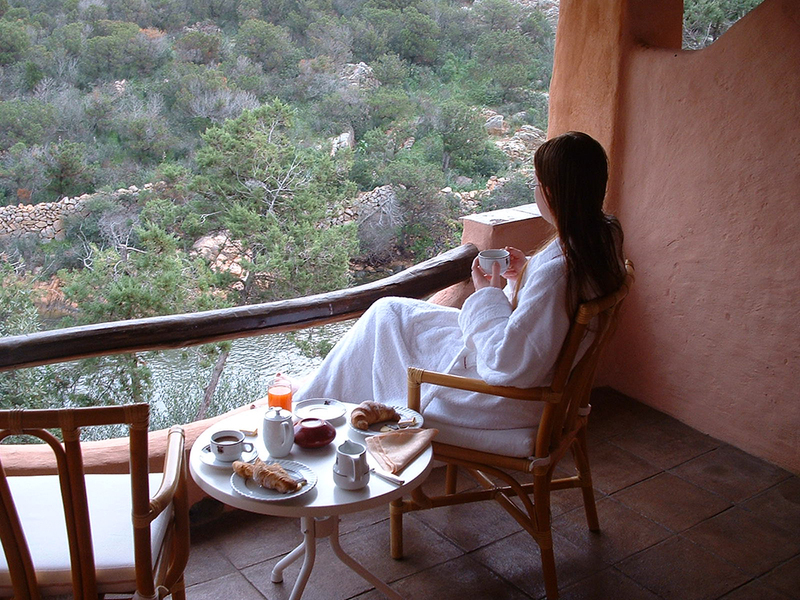 I was woken by a dawn chorus; birds chirping in the bushes across the water. That breakfast, oh my goodness. It was the first time I’d ever tried blood oranges – I’d never even heard of them before then and I was intrigued by their gorgeous red orange colour. The taste of that freshly squeezed juice, it lingers in my memory. 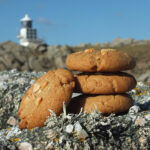 I have not tasted fresh blood orange since as I can’t obtain the fruit on my remote North Sea island home. I fell in love with olives, and cheese, and bread and wine. As part of the car launch we had to drive a circuit around the island, stopping frequently to sample the local delicacies. This was long before I began taking food photographs, and I can’t believe I only have one food photo of my entire trip there; a photograph of the tuna lunch we were served. The lunch that I turned my nose up at because I couldn’t stomach the idea of eating nearly raw fish. That and I was still feeling the effects of the copious wine from the night before. We’d been treated to this amazing eight course meal (I still have the menu somewhere in a closet) with suckling pig, tiny whole baby octopus, seafood, pasta, desserts… and the wine was flowing. The waiters, as soon as your turned your back, would top up your glass so I had no idea how much I’d consumed. The following day I just couldn’t face the thought of raw fish with a hangover, so I nibbled a bit of the salad, ate the pickled figs and the waiter cleared the table. I wasn’t much of a seafood fan then (unlike now) and I thought I did really well with trying all the new things the night before, but faced with what looked to me, massively undercooked bordering on raw seafood, I balked. Then the chef came out of the kitchen and asked me what was wrong with the dish! He was not impressed with me at all, and I mumbled something about not being hungry, all the while wishing the floor would open up and swallow me whole. I can still feel the burn of my blushing today! If I could only go back in time with my current love of food, oh how I would lick that plate clean! That tuna is cooked to perfection! One of the places we stopped (most of my photos are blurry landscape shots from a moving car) was at a Giant’s Tomb; a remarkable piece of archaeology dating back to the Bronze Age and the Nuragic civilization. It was February when I was there, and one thing that stands out in my memory was that it was raining mud. A dust storm had swept across the Mediterranean from Morocco causing the sky to take on a brownish hue and the fine, talc-like sand was falling in rain drops. This was causing much stress in the men who were trying to keep the cars clean for presentable car launch publicity photographs. Here you go, a rare and elusive face photograph of me in all my slightly hung over glory. The Fiat Idea was launched in 2003, so it’s a pretty old photo. You can see the fine mud drops on the bonnet of the car. At that point in time I was a mother of just one, and this was the first time I’d ever left him for any length of time. He was 3 and when I returned home he was bright red as a strawberry. He was feeling fine with no temperature to speak of but his skin was the colour of a tomato! I took him to A&E in all my mother-panic where the doctor (bizarrely with a hint of delight in his voice!) diagnosed him with scarlet fever. Tears welled up in my eyes. The only time I’d ever heard of scarlet fever was in the novel Little Women by Louisa May Alcott when three children in a family had died from it and I was instantly in worse-case-scenario mode. The doctor chuckled and told me not to worry, a course of antibiotics would sort him out in no time. Fast forward thirteen years and my eldest (who is also now minus an appendix – what is it with him and his near-death experiences?!) 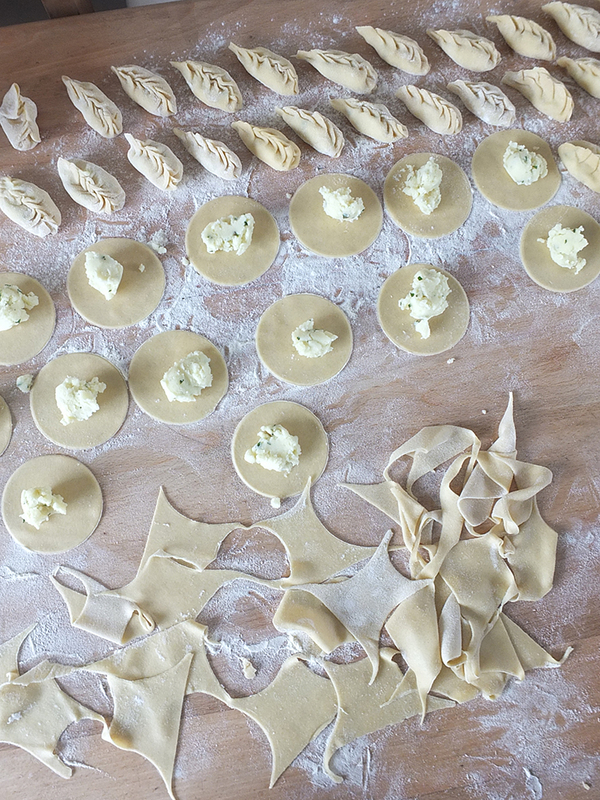 and I spent a wonderful hour together the other day preparing culurgiones, traditional Sardinian ravioli. James Villas Holidays is a UK holiday accommodation provider with over 30 years experience, expertise and enthusiasm in bringing you the very best villa holidays abroad. They have challenged me to recreate a recipe from one of their holiday destinations for their #MyHolidayDish campaign. 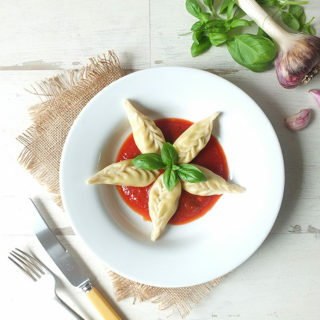 As I’ve got such fond memories of Sardinia I chose to attempt to make their traditional regional specialty – culurgiones, a filled dough pocket not unlike ravioli. I went to this recipe for inspiration. 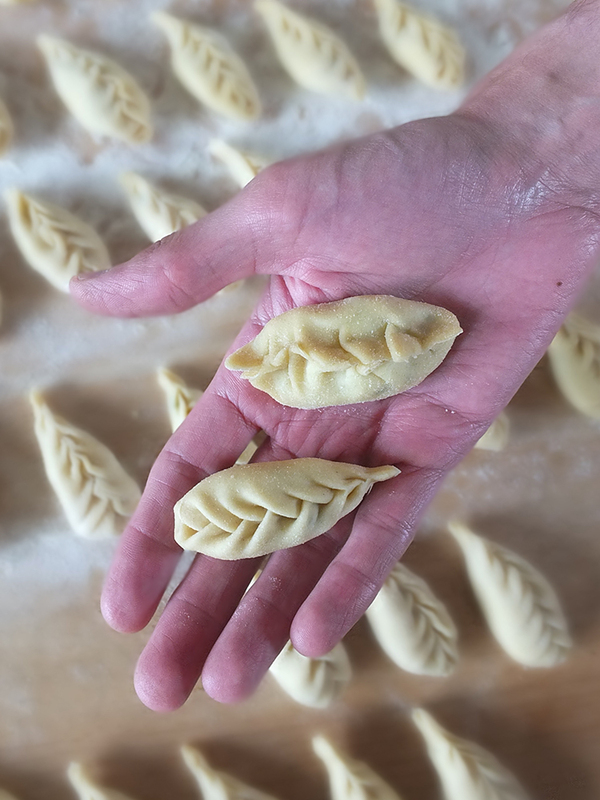 The dough, filling and sauce are remarkably easy to make, but the trick is to get the stitching process correct so that each filled pocket resembles a wheat sheaf. 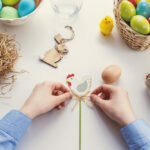 I watched this video tutorial about 50 times, I swear – start at 56 seconds and watch over and over again following along with a culurgione in your hand. Sometime between the first batch and second batch of rolled pasta dough (about 30 tries!) something clicked and my ravioli began to look more and more like they were supposed to. 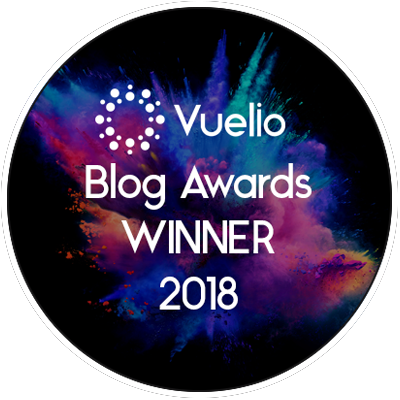 For the sauce, since the recipe I used for inspiration didn’t provide one, I asked the only Italian person I have any current dealings with – Simone over at Fine Italy (see my review and giveaway for some seriously good Italian food here!) who, as chance should have it, used to spend a month at a time of his childhood summers camping on the island of Sardinia. His parents used to have friends that lived there so he gave me the recipe his mother used to make, for which I am very grateful. It’s a very simple recipe but the key is to use fresh, good quality ingredients. I used fresh basil and garlic grown by my local CSA veg box providers. For the sauce I used some Cirio passata, while the extra virgin olive oil I used was grown by a man named Antonio in the Campania region of southern Italy and distributed by Pomora (see the badge in my sidebar). 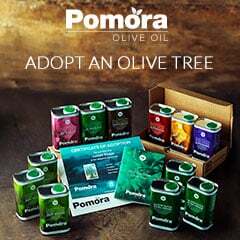 I took a delivery of their extra virgin olive oil just the other day. Gorgeous stuff. I couldn’t source authentic Sardinian Pecorino cheese here in Shetland (but I have tasted it before – I was sent home from the car launch with a round of it in a goody bag. I remember having no idea what to do with it…. ), so I used Parmesan instead, the next best thing. Culurgiones are served with only a little bit of tomato sauce, I am told. There should still be some white of the pasta showing through the sauce. The way I’ve served them is likely far from traditional but I thought it was rather pretty and I do like to put my own twist on to things. In true Italian style we invited a neighbour over for dinner to help us eat the pasta, and he thought it was one of the best meals he’s ever had. Restaurant quality, he raved. If you are wanting more #MyHolidayDish inspiration, or perhaps something a bit easier to make, why not try Jo Pratt’s pork meatballs in a rich tomato sauce. For holiday inspiration why not browse the James Villas website. They even have villas where I stayed in Porto Cervo! Oh how I would love to return there one day. 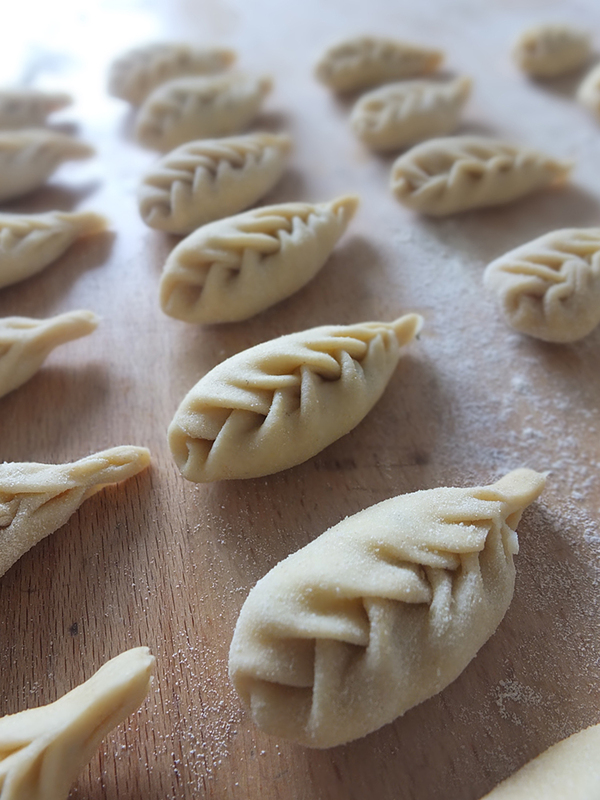 Considered to be a traditional Sardinian delicacy these little stuffed dough pockets are remarkably easy to make, once you get the hang of the stitching process! First prepare the filling. Peel and cube the potatoes and cook in boiling, salted water until tender - about 15-20 minutes. Drain and return to the heat for a few minutes to evaporate some more of the liquid. Rice the potatoes with a potato ricer or pass them through a fine sieve. Add the remaining ingredients and stir well. Set aside for an hour, at room temperature, to cool. To prepare the pasta dough whisk together the flour and semolina until combined. Add the olive oil and sea salt and add about 100 ml of the lukewarm water, adding a tablespoon at a time of the remaining water until a dough forms. Knead for two minutes until smooth and elastic, adding a little bit more water at a time if needed. I just dipped my fingers into the water to add it to the dough. Cover in cling film and leave for half an hour. 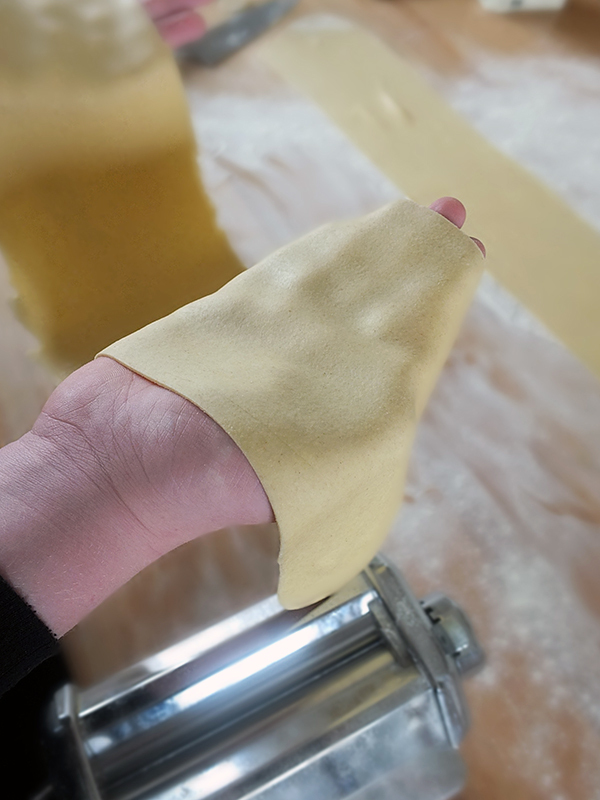 Cut the dough into two equal portions and run each half through a pasta machine, starting with the thickest setting. 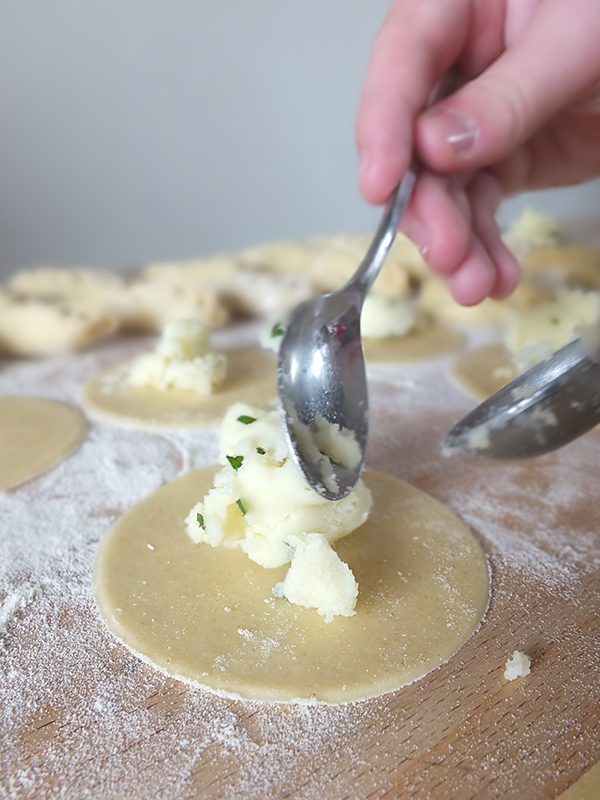 Fold the dough into thirds and run through the thickest setting again. Repeat, if needed, to get an even width of pasta. Run the dough through the machine again a few more times, selecting a thinner setting for each run. I rolled mine until it was at the second thinnest setting. Using an 8 cm round cutter (I used a glass tumbler) cut the dough into circles and place on a floured surface. 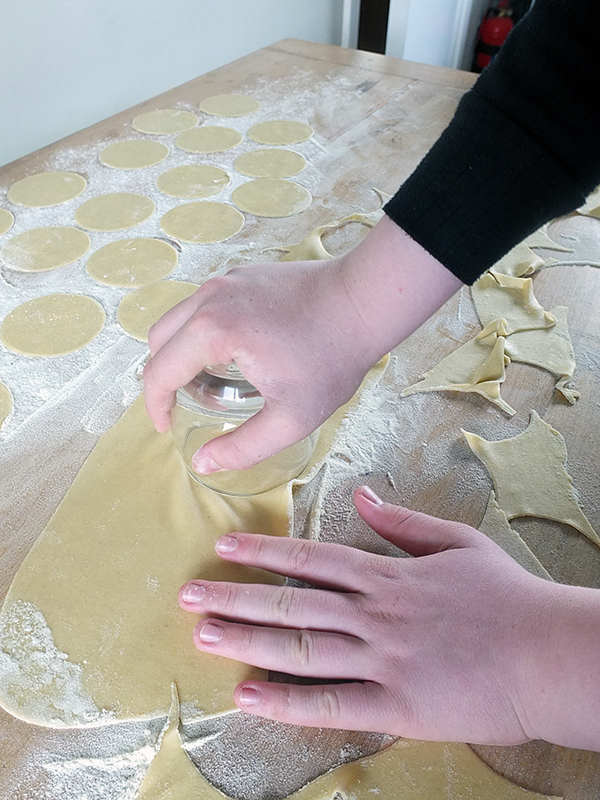 Place a heaped teaspoonful of the potato filling into the centre of each pasta round. Cup the round in the palm of your hand like a taco shape. Pinch about 1 cm of the end together. Push the pinched dough in and slightly to the left, folding the edge of the dough into a bend and pinch that in and slightly over. Repeat on the other side. (Watch the video link above to see how to do this). Continue pinching and folding the dough over and down all the way up to the top of the dough and pinch the end closed. You will have a filled pocket resembling a wheat sheaf. Set aside on a floured surface and repeat with the remaining circles. Bring a large pan of salted water to the boil and boil the culurgiones in batches for five minutes. Meanwhile, prepare the sauce. Heat the oil in a saucepan and gently fry the garlic for a minute or so until its aroma is released. Add the passata and cook for three minutes. Remove the sauce from the heat and stir in the torn basil. 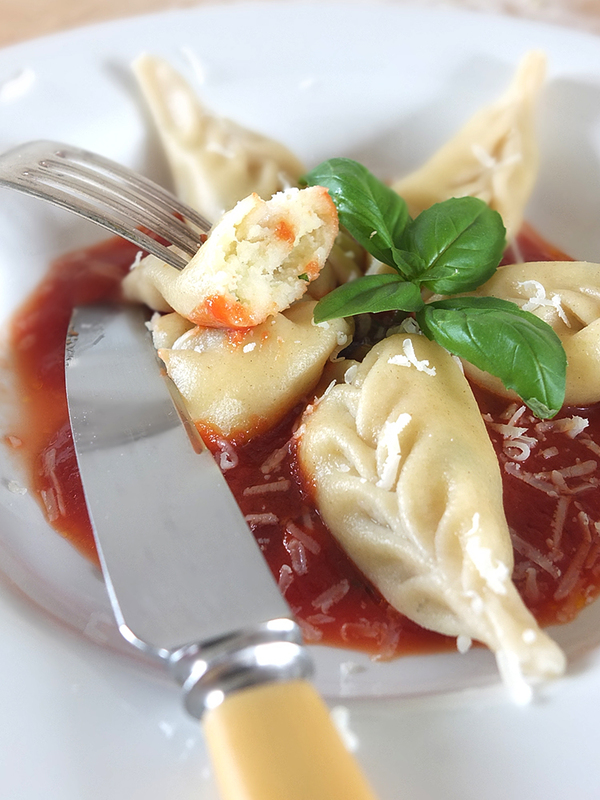 Serve the culurgiones immediately with a little bit of the sauce with extra basil and grated Pecorino cheese. 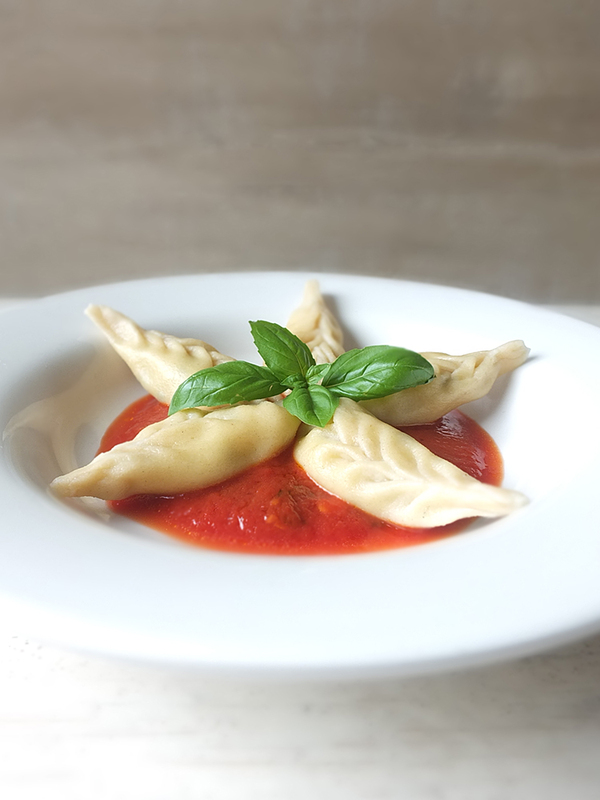 Leftover culurgiones can be frozen for later. Simply cook from frozen. There are regional variations of this dish. Some add gently fried onions to the filling. Others use fresh tomatoes in the sauce, in which case cook them for 8-10 minutes only. Disclosure: this is a paid post in collaboration with James Villas Holidays. Thank you for supporting the brands who make it possible for me to do what I love – mess up my kitchen and share recipe stories! Totally beautiful shots. I love the folds in your ravioli, which I’ve never seen done before! Thanks!!! I’m going to try being a copy cat on this recipe. Wish me luck! These look gorgeous, your shaping skills are amazing. They sound delicious too! These sound gorgeous, just my sort of thing! I’m so impressed with your neat folding – loved the comparison photo of your first and last attempt 🙂 And loved seeing the old photo of you as well – I adore your long hair! That looks super delicious! I would love to try this out when im making lunch and thank you for proving the recipes and tutorials. Laura @dearbearandbeany recently posted…Review: CaseApp…Plus a Fab Giveaway! Kia 2003, to think that was over 10 years ago lol. Oh this is incredibly pretty! 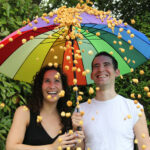 Everything looks lovely and easy to make apart from the actual pasta! I fear I’m too heavy handed and impatient to make it look that nice. 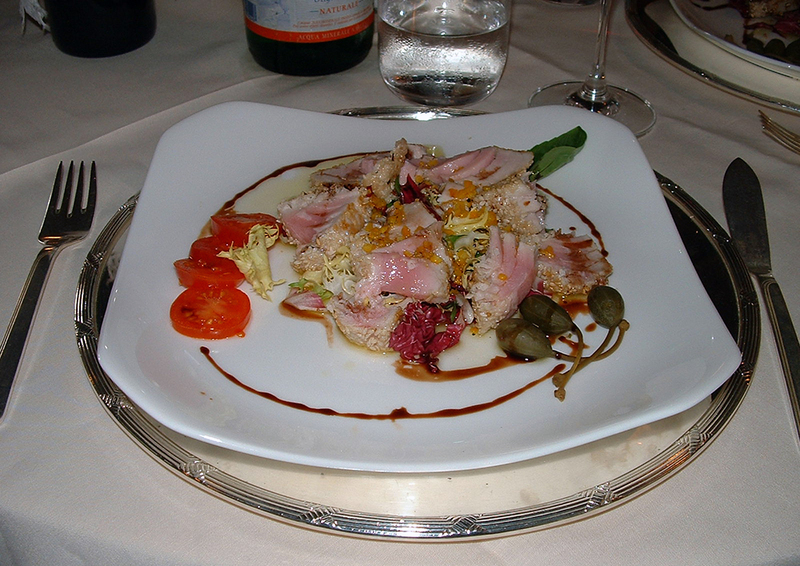 Sardinia is high on my list of places to visit, and even more so with meals like this. it just looks so light and fresh. Kate – gluten free alchemist recently posted…Miss GF Makes #5 – Crazy Bright Olympic Cake & Putting Wow Cake Mix Through its Paces! Well done on mastering th3 ravioli. Im not sure that i would have had the patience to keep at it. It looks yummy! The dish looks super yummy! I’d love to have a go at this so bookmarking this for future reference. Also, I’m well jealous of you going to Porto Cervical! wow, sounds amazing. 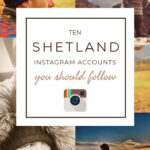 I’m pinning to make these but I doubt they’ll look anything like yours! Oh wow, I’ve never seen pasta look so beautiful. I love the finish!